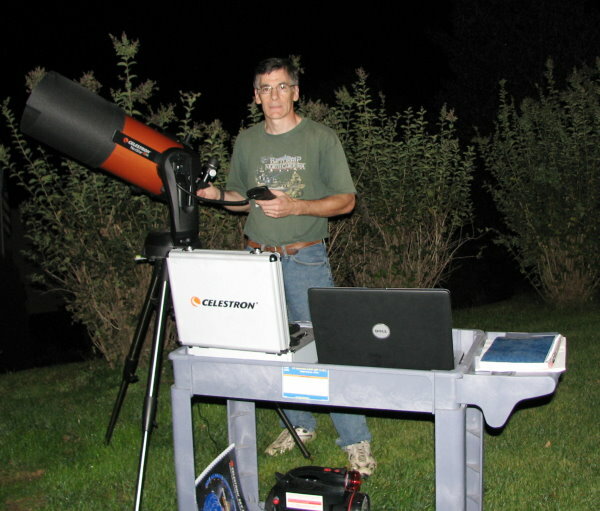 Here I am in my back yard in Erie, Pennsylvania, "playing" with my newly acquired (in June) Celestron NexStar 8SE telescope. City lights are fairly bright here to the east and west, but farm land is to the south and Lake Erie begins two miles to the north, so that limits the light pollution somewhat. Erie is not that large of a city, so that also helps. Still, compared to the truly dark skies in areas I have lived in Vermont and Colorado, the seeing is noticeably bad. I haven't had a chance to try any of the filters that came with the eyepiece and filter kit that came with the scope. See my teardown report for the NexStar 8SE. 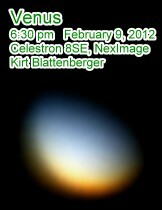 I also bought a Celestron NexImage camera for use with the telescope. It is only good for really bright objects like planets and the moon, mainly because the stock interface does not allow long time exposures. However, there is a hack online that modifies it for longer settings. The pixel resolution is only 640 x 480, so it's probably not worth the trouble. 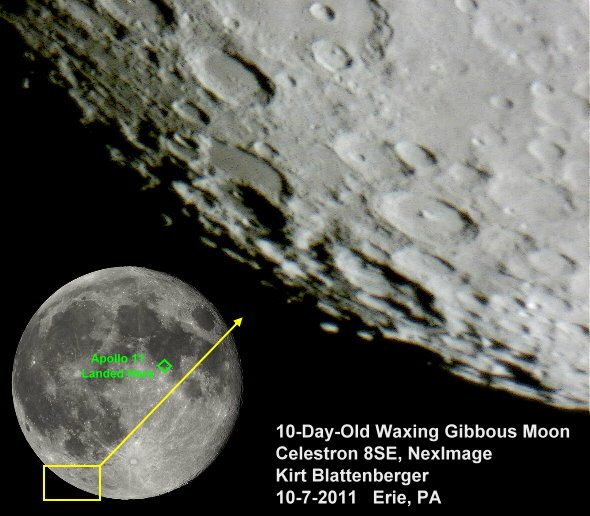 I've seen some pretty impressive photos of the moon and Saturn that were taken with it. Deep sky photos will probably have to wait until I have $800 or so to throw at a DSLR camera. 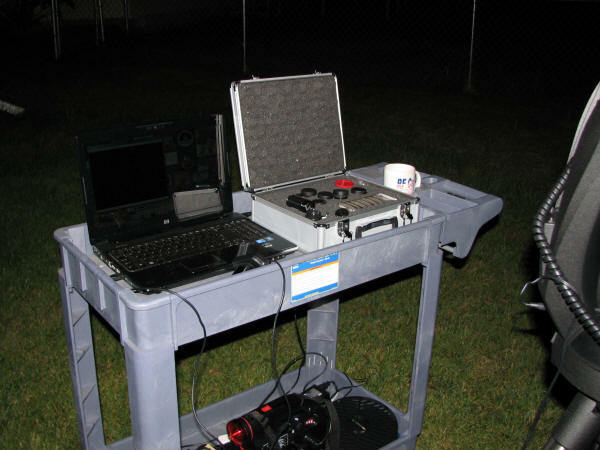 The equipment cart is really handy for transporting the DC power supply for the telescope, the Celestron eyepiece and filter kit, dew cover, notebook computer, etc. It also places everything at a convenient height for working. One advantage (if you can call it that) of having so much ambient light to deal with it that the extra light from the computer display is not too annoying, plus, it provides enough light to view star charts. For times when I don't bring the computer out, I have found that the light from the GoTo hand controller is just bright enough to allow the charts to be read. 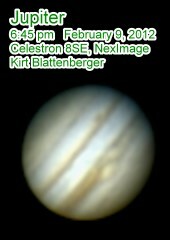 To the left is more recent image (2/9/2012) of Jupiter. I'm getting a little better. The sky was exceptionally clear, winds nonexistent, and the nearly full moon had not risen above the eastern horizon yet. Jupiter was about 15° west of due south, high in the sky. My Celestron NexImage was used with a 2x Barlow lens. The photo is a composite of about 500 short time exposure images recorded at 5 fps. This really helped avoid atmospheric scintillation. If I had done a better job on the focus, the detail might have been even better. RegiStax v2 software was used. To the right is my first ever image of Venus. 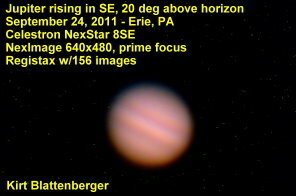 Below is my first picture of Jupiter, taken on the evening of September 24, 2011, in Erie, Penn. Sure, there are millions of nicer examples out there, but they aren't mine. The seeing conditions were not great, with a slight haze and very heavy dew. The dew shield helped, but when the telescope is facing skyward by more than about 45-50 degrees, the dew manages to condense on the glass anyway. This image was generated by RegiStax using the best 156 frames out of a 301 frame shot. By November, Jupiter will be nice and high in the sky in the evening, so there won't be as much unstable atmosphere to look through. Here is a handy moon age calculator. Here is an equally handy Great Red Spot transit calculator. I'll soon post a photo of the truly nice custom fabric dust cover that Melanie made for me that conforms perfectly to the telescope and even to the 9x60 mm Orion finder scope that I installed in place of the stock el-cheapo (but very functional) finder. 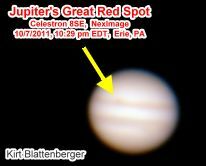 On October 7, 2011, I managed to capture Jupiter's Great Red Spot using the Celestron NexImage camera. It's not very good, but I did confirm, using the Transit Time calculator on the Sky & Telescope website, that there was a transit at 9:46 pm EDT on that night, so it's definitely the Great Red Spot. All four Galilean moons were also clearly visible that night, too.